For starters, I want to apologize for the lapse of what has it been? Two weeks? Three? I am starting to feel it was a rash promise, “New post every Monday.” (I really must amend that) Especially since some of them more than usually require research. (Like today’s). Also recently I’ve been ill, and the internet has been down. (Remember, this is Guatemala here, and we have regular power outages, etc. And when it rains I can’t see some of my favorite channels on television. Life is hard) But mostly it’s because this post is a victim of mission creep and now it looks like it may be a three parter, instead of the projected two (I refer to the current Aldous Huxley theme). Moreover, much more difficult to execute than my usual stuff I can at least do a good first draft of off the top of my head. But this is more like writing a paper for a literature class. So I fear it’s a tattered flag I am saluting with this post-a-week promise. And I have noticed some other blogs which are far more intermittent than mine. And a wee voice talks about a happy balance between maintaining a schedule, and not having a nervous breakdown. If any are not into a faithful vigilance towards blogs, and yet would prefer not to miss one of these posts, remember, there is a follow button. Press that, enter your email, and one can relax and await notification by email when a new post arrives. But that sounds unpoetic and I usually at least try to be dramatic. Which suggests what they always tell you in writer’s school: You need a “hook” atop your oeuvre to pique the reader’s interest. Oh dear. Digression ataque de nuevo. Sigh. Back to Aldous Huxley. Even in high school I was fascinated by his work. I read almost every one of his novels including of course, his famous cautionary tale of a future dystopia, Brave New World, often paired with George Orwell’s 1984,** which provides a darker future of a Stalinist police state that can practically read minds. Huxley’s was less dark, but the point was, that even though they ruled more by drugs and hedonistic mind conditioning than by threats of pain and such negative feedback, yet the horror was achieved. The horror being what happens when you are denied your humanity, your heart’s scope. Your heart’s hope. There. Maybe that’s my title! Aside from Brave New World (which fyi is the less depressing read, of the dicho dystopias) there was Ape and Essence, Eyeless in Gaza, Time Must Have a Stop, Chrome Yellow, Antic Hay, Point Counterpoint, After Many a Summer Dies the Swan (another wry fantasy novel dealing with a “breakthrough” in the direction of human immortality), and importantly, his last novel, Island, which had a more mystical bent,*** and also featured a future alternate society, but this time beneficent. Even if it was a Jesus parallel. In that this society got invaded and lost everything to their non-mystical neighbors. Kind of a crucifixion of innocence kind of thing. I have always remembered Huxley’s Island, or at least the incident with the young boy being bitten by a large snake, which of course terrified him. The elders would not be content to let the boy who survived nicely, forget the incident. No, they made him relive it by constantly describing how it was, down to remembering all the details, so it would be a part of conscious memory instead of being forced underground into the subconscious where otherwise it would live and do its dirty work in dreams or a generalized sense of dread. All of which showed a marvelous understanding of the human psyche and how to deal with it without doing any harm, and beyond that, to actually cure mental damage and maintain mental health. It was essentially Buddhist philosophy. It’s best of course if this title eloquently encapsulates the idea of the poem. **By an interesting coincidence, when Huxley briefly taught writing, one of his students was George Orwell, whose also dystopian (plenty scary) cautionary tale, 1984, is usually paired with Huxley’s Brave New World. Such a small world. As this post also demonstrates when you get to the coincidences. 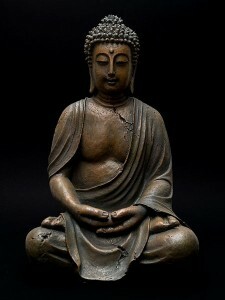 ***In his later years, Huxley became focused on Eastern mystical ideas, such as mentioned above, Buddhism. ****smacks of Zen do it not? “From the beginning, children are taught to do things with ‘the minimum of strain and maximum of awareness’ “.